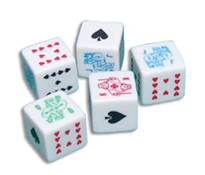 Choose from a variety of Poker Dice Sets, Jackpot Dice Sets, and Put and Take Dice Sets. 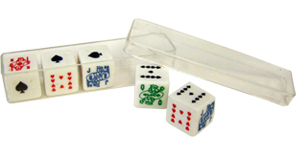 These sets are available with a number of dice sizes, and many include instructions for play. 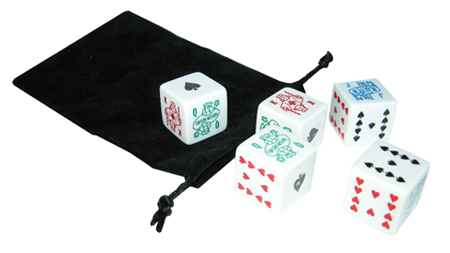 Choose from four different poker dice sets, each with five dice. 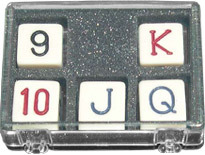 We carry 5/8" poker dice, 11/16" inch engraved poker dice, and jumbo 1" poker dice. Feel free to browse our selection of Store / Novelty Dice, Dice Cups, and Casino Quality Precision Dice. Or, contact us at 1-800-233-0828 for a FREE 96 page gaming catalog.